Germany's solar power industry used to be a leader of the renewable technology's global expansion but a series of political blunders has killed off solar power companies and passed the torch on to China, solar power researcher Volker Quaschning says in an interview with the Clean Energy Wire. The academic says Germany still boasts first class solar technology research but bureaucratic hurdles and the persistence of coal in the German power system inhibit an unleashing of the sector's full potential. Quaschning says Germany and Europe could regain ground in solar power leadership lost to Asia - if the political will changes. CLEW: How is Germany’s solar power sector doing? Volker Quaschning: This very much depends on what part of the sector you look at. The manufacturing sector, which produces the solar power hardware, is practically dead and buried forever in Germany, except for a few niche producers. If you look at the service sector, which carries out the project planning or the installation and maintenance of solar arrays both at home and abroad, or at the hardware supply industry, things are looking moderately positive. The decision by the European Commission to drop tariffs on cheap solar panel imports from Asia in September 2018 has caused a great stir in the German and European solar power sector. Some regard the removal of minimum prices on imported panels, which were meant to protect European manufacturers, as a death blow for the industry. Others say it will lead to a new wave of solar power expansion on the continent. Are they both right? The German manufacturing industry can almost not be decimated any further. There are only a few companies left who employ only some hundreds of people, which is chickenfeed if you compare it to the 80,000 jobs lost in the solar sector since 2012. They have all gone to China now since the government basically called off the energy transition in Germany’s solar power sector. By losing their home market, the German manufacturers stood no chance of survival. On the other hand, if I plan to build a solar panel on my roof, maybe also with a battery storage, it needs planning, installation and technical management, all of which is done by German providers. The panels may come from China but they account for less than half of the added value of a solar array, so the bigger part is made in the home market. And German companies operating at the end of the value chain also use their great expertise to make business abroad. Could German hardware producers regain part of their former strength through innovation? This is difficult to say. Germany used to be the world’s leading market just five years ago. By doing the coal industry a favour, this position has been handed over to China. In 2017 alone, China added 53 gigawatt (GW) of solar power capacity, more than Germany has installed over the course of 30 years. The Chinese government identified solar power as a key technology of the future and made sure it possesses all the means of production by granting generous financial assistance to Chinese companies. The EU tariffs were powerless against that and China is set to catch up on all aspects pretty quickly, not least because they currently account for half of the world’s new installations each year. Germany’s advantage will probably vanish fast, although stereotypical German strengths like reliability and sound product quality, plus the decades of experience in Germany, could help to maintain some ground. Of course, there are interesting and innovative concepts by German firms that combine solar power with storage solutions and decentralised demand management systems. But these are things that Chinese companies can learn to do as well - and they might even have an advantage thanks to the greater pervasiveness of electric vehicles. Things like that happen much quicker in China and we really have to make an effort if we don’t want to fall behind. Germany’s economy minister, Peter Altmaier, said storage technology will become a key target of technology support in Germany and Europe, promising that the EU would help create an ‘Airbus for batteries’ that is capable of competing with Asian battery producers. Could this give the solar power sector some leverage, too? As long as the core technology for batteries, the battery cells, come from Asia it will be very difficult for German and European companies to gain any advantage, since they cannot fully control their supply costs. This can only be achieved if German industrial policy really focuses on supporting development and carries through with it. It doesn’t help to say that we support one technology and to then sabotage it by supporting competing industries like coal. And as long as there’s a large share of coal in the system, solar power cannot be expanded at a meaningful scale and this will hinder innovation. If there’s no coal exit in the next ten years accompanied by a rapid growth of solar power, China will have vacuumed any innovation by its sheer lead in size. There’s some hope that a better integrated European market allows European producers to scale up operations but China could take the lead here too. What could be done to prevent this? There must be clear planning security for investors. A serious European battery production project would need an investor willing to put forth, say, ten billion euros in a gigafactory. If we only pay lip service to boosting electric mobility, the main target of batteries, no investor will run the risk. There needs to be a credible perspective for a bustling European e-car market to make it happen. Business aspects aside, how is Germany positioned in solar power research? Things look a lot better here. Research institutions are doing quite well. But they too have suffered from losing many commercial partners from the domestic solar power industry. Even if world-class solar power technology can still be developed in Germany, the research institutions have no one in the country that could market their products. By contrast, the biggest Chinese solar power company now throws greater volumes on the market than all remaining European manufacturers together. So, if you don’t come up with a new product that really pushes the envelope in innovation, it will be very difficult to challenge Chinese dominance here. There are some promising fields of research, like perovskite technology, that have the potential to do just that, but it is far from clear if there will be a real breakthrough. About ten years ago, the consensus was that silicon solar cells will never become cheaper than one dollar per watt. The Chinese now sell them for 30 cents per watt – and prices keep falling. Even though silicon panels might not be the best possible technology, they still are the go-to standard in solar technology simply because they’ve dominated for so long. A bit like combustion engines in mobility, if you will. What about sustainable production? With the growing volume of solar power capacity around the world, clean sourcing and recycling of input materials is becoming ever more important. Could this be a lever for German and European producers to regain market shares? 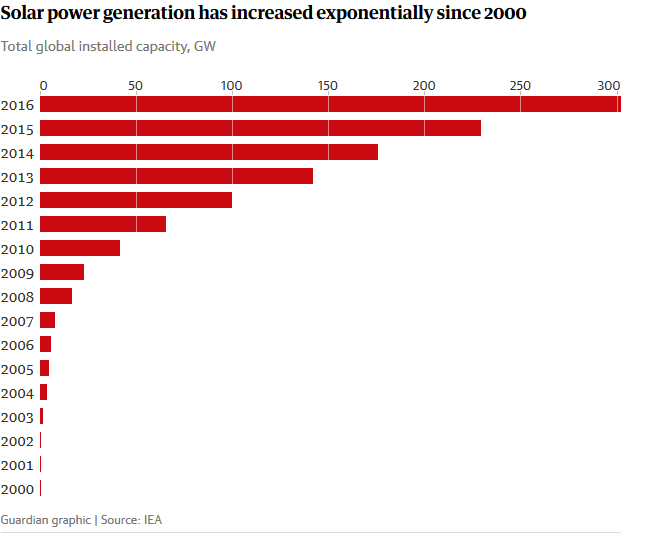 Well, maybe sustainability could be a lever, but as long as we have a share of coal power of more than 40 percent in the German power mix, it’s rather difficult to say that China produces the panels in a less sustainable way than we do. Even if European products are a bit cleaner, the difference is not big enough to justify a complete change of suppliers. Things could look different if carbon emissions in production would cost industrial manufacturers across the board in Germany and Europe, and not just solar panel producers. This would have the added advantage that it pushes coal out of the market and increases the domestic solar power market’s size. Is there a way for German policymakers to regain some ground at all vis-à-vis China? A first step would be some sort of a new “masterplan” for the Energiewende that defines the necessary market size for renewable power sources to meet the Paris Agreement’s emissions reduction target. Germany is a signatory to the agreement but has not defined a path to meet its targets. We at HTW Berlin estimate that expansion volumes have to be increased eightfold to meet the Paris targets. If the government said it is ready to back a far more ambitious expansion path, this could bring big investors, like Bosch or Siemens, back and change the prospects significantly. Should the support rates for solar power rise again to revive the market? No, this is not even necessary. What is needed is trust by investors that the market will grow at a somewhat predictable rate. But the reversal is the case today. There are so many regulations, caps, taxes and other red tape regarding solar power that many potential investors hesitate to engage just because they do not want to deal with the bureaucratic hurdles. And I fully blame the government for not doing anything at all about this. Apart from the German solar industry’s business prospects, could the removal of trade barriers for Chinese panels at least boost capacity growth and induce a new wave of expansion? The government has done a lot to put the screws on solar power expansion to prevent an “explosion” of the market. Investors that install a solar panel for own consumption have to pay a surcharge on arrays that have a capacity of more than 10 kilowatt, which makes the investment less attractive. Then there’s tenant electricity, an absolute non-starter. Investors have to obtain dozens of licenses and fulfil other formalities before they can use their own solar panels that many refrain from putting any money into it. This would have to be made much, much simpler before growth matches the rates that were seen before 2013. If I collect rainwater for self-consumption, nobody will interfere or tax me for it. The same would have to be true for collecting solar energy for self-consumption. The fact that panels now are likely to become a little cheaper won’t kickstart a new expansion wave due to all the red tape. Assuming there is a significant increase in solar power capacity soon, is the grid now better suited to cope with it than it used to be? As long as we still have the dilemma that coal plays a huge role in the power mix, things are unlikely to improve a lot. Coal plants and especially lignite plants are designed to run around the clock and cannot be turned off easily if a lot of solar power is fed into the grid at noon every day. If solar power capacity reaches a certain threshold, it will no longer be possible to operate coal plants at a profit. So if these were taken offline and replaced with more flexible gas plants, the grid could cope. But this has not happened yet. What about decentralised consumption? If the next wave of solar power expansion takes place in the cities, close to where it is consumed, could this be an option to achieve quicker system integration? A greater expansion in the cities is desirable but it won’t be sufficient to reach the necessary expansion levels. Apart from mounting panels on nearly every roof, in the long-term there will need to be more capacity from large field installations as well to complete the Energiewende. However, there still is vast potential in the cities that needs to be tapped quickly to achieve the necessary expansion levels at lower cost and without the additional land consumption of field installations.